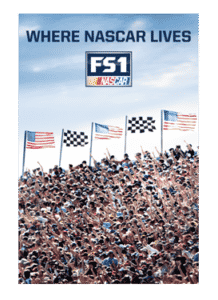 The Great American Race marks the start of one of the most watched sporting series in the US – The 36 race NASCAR Sprint Cup Series. Last year 13.36 million viewers watched the Daytona 500. What better place for them to watch it and all the NASCAR races than at your bar or restaurant? Of the 50 most–watched sporting events in the United States in 2015, a whopping 43 were NFL games topped by the Super Bowl. Of the remaining 7 most watched events, 3 were College Football or Basketball playoffs, one was the Women’s World Cup Final, and 3 were NASCAR races. Your customers are watching NASCAR on TV. Are they watching it at your bar or restaurant? 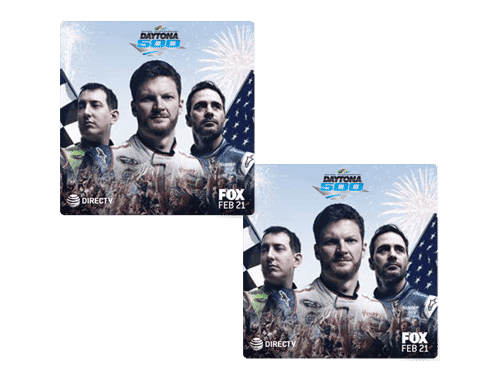 As part of the DIRECTV MVP Marketing program for bars and restaurants, they make promotional materials like the Pennant String for the Daytona 500 above, the Poster to the right, Decals and more available for bar and restaurant subscribers. Subscribers to most of the premium sports packages like NFL SUNDAY TICKET™, MLB EXTRA INNINGS™, NHL® Center Ice® and NBA LEAGUE PASS, receive FREE Promotional Kits that contain Banners, Posters, Coasters, Decals and other items like Sidewalk signs. DIRECTV also has the SPORTS BAR FINDER app for both Android and iOS. The Sports Bar Finder App helps drive customer traffic to your bar or restaurant, allows new patrons to search for the bars closest to their current location, and lets you promote events, specials, and deals right on the app. As part of the MVP Marketing Program, DIRECTV also makes available a daily schedule of every sporting event they broadcast, so you can always know exactly what events are on TV.